A journey with the Global Grandmothers. 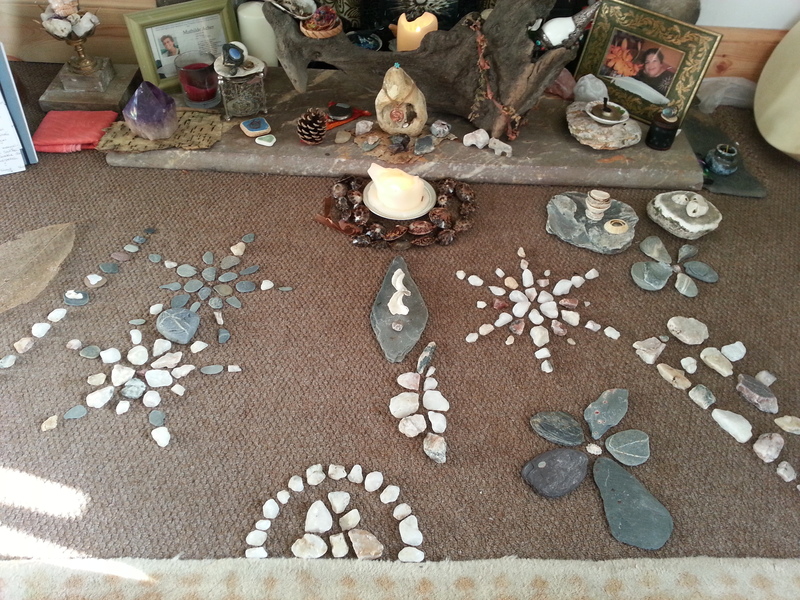 In a circle formed by the love and intention of women in different places on the planet, I was sitting at Good Shadow Studios on the West Coast of Scotland, holding the North-West – the direction where Earth meets Water, and my place of perfect stillness. I am immensely grateful to all the beautiful women who journeyed with me as one on the cosmic web last night. When I began my journey, Grandmother Spider zoomed me through her luminous web at lighting speed… places, situations, loved ones. Questions. Grief and joy and much confusion, almost at fast-forward speed – or was it rewind? – in one big swirling chaos. I felt small and lost, caught up in a story that was very clearly of my own making. But I couldn’t seem to get out of it or bring any order to it, or find much purpose. While I was trying to accept and surrender to this, the cosmic web began to rumble and vibrate, at first only faintly, but then in violent, eruptive spasms, like a series of earthquakes. Dust and particles flying around in huge electrical storms… and amidst all this a dark eye began to form around which everything began to gravitate. Grandmother Earth was taking me back to her own birth! If I had been worried about the drama of my own story, this soon clarified my perspective. The violence and the rawness! A boiling ball of blood red lava, being hit by meteorites over and over and over, contorting and erupting, hurtling through the void. After an eternity in this state of utter rawness and chaos – was it creative or destructive? -, soothing water began to appear and cover and cool things. I was submerged and weightlessly suspended… anemonies, corals and whale song, too beautiful after all the violence and chaos. My heart could barely contain it. Then, land appeared and trees and air and birds… I crawled ashore in complete awe. “How can I best serve you?” I asked her. Her voice was calm. She said that all things are born, grow, wither, die and are eventually reborn. She said that what she would love for us humans to understand is that, despite of what we may have been led to believe, she is now in her SWEET phase. That her life cycle is completely beyond anything humans could ever do, and that this is a time to celebrate life and beauty. “Be a gardener who opens people’s eyes to this truth!” she said. I looked around and found myself back in Grandmother Spider’s shimmering web, where everything was now in its perfect place. Just then I was being recalled, so I returned to the circle, my heart overflowing with love and gratitude for what I had seen. January 10, 2016. Today is Sunday, and I’ve decided that it is a day of joy and celebration. Tomorrow will be, too. And the day after that. And after that… I may go out for a walk in the forest later. Happy New Moon in Capricorn! This morning as I was emerging from sleep it seemed that I was on the edge of a woodland looking up, and a large bird of prey, like a buzzard but more slender and elegant, was circling above me. It took one more turn, then it glided off towards the woods. I felt that it had been watching over me while I slept and was filled with immense gratitude for its presence. I hadn’t even asked for it. 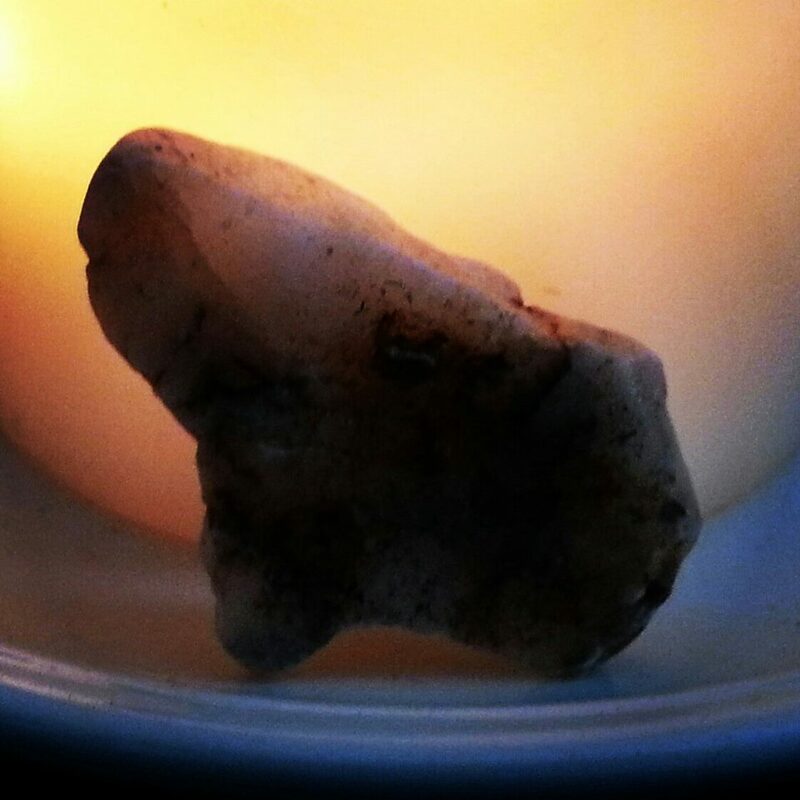 At other times, having a long history in shamanism, I do ask spirit animals for help, and without fail help is given. Where does it come from? Spirit animals and other helpers definitely do not reside in the mind, as any “ha ha” linear-thinking western rationalist will happily confirm. They show up in our shadow zones, in the border lands between waking and sleeping, at times of great despair or elation or emotion in general. It seems that our awareness of them requires an opening of intuition and feeling. Interestingly, our ancestors probably wouldn’t have seen any difference there. I don’t think they distinguished between their body, mind, emotions and ultimately spirit as most modern westerners do. All equal aspects of their existence. Their surroundings – birds, bees, flowers, trees, rivers, clouds… also equal aspects of nature, of their existence, of their reality. All equally inhabited by life force, by spirit just like them. From this perspective, communicating with other aspects of nature becomes relatively easy. Indigenous peoples still do it, and it is generally called something along the lines of dream time, or dream walking, or journeying. Why do they do it? To access their animal instincts and qualities. To look at a situation through different eyes. To cultivate their connection with everything else in their universe. The help that is obtained in this way is a change of perspective, and a renewed awareness of connection. Ah, now we’re getting somewhere. This is something you can actually read about in the papers. How many people have problems nowadays with answering some of their most fundamental life questions? Feel disconnected or lost? Perhaps they should consider dream walking or journeying. Labyrinths are ancient tools and have been used by humans since the beginning of time. While the modern world around us may be very different from that of our ancestors, the essential aspects which make us human remain surprisingly unchanged: Among them is our need for contemplation. 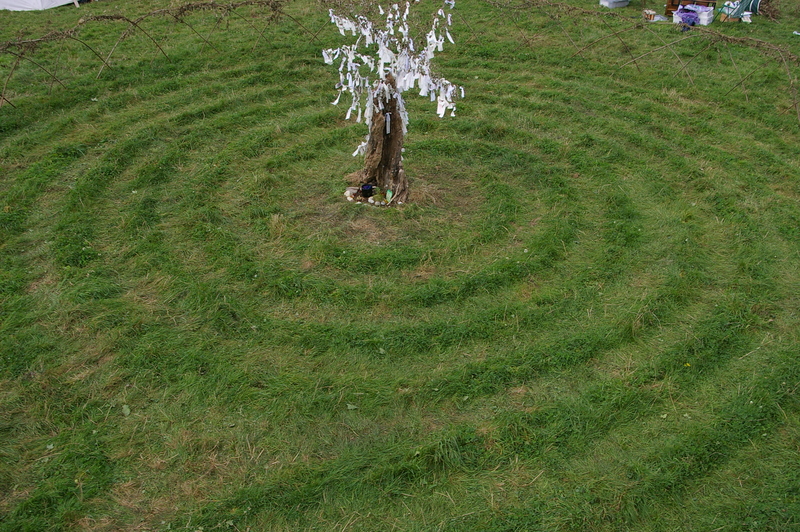 Grass footprint of festival labyrinth with central wishing tree. Bestival, Isle of Wight, 2010. In a world full of distractions, a labyrinth provides us with a dedicated space and pathway for taking this active pause and ponder our questions. It also gives us the opportunity to connect with our centre, with the earth under our feet, and with the sky above… we can put our lives in perspective. Unlike mazes, labyrinths do not have dead ends and only have one entrance and exit. Rather than having to ‘search’ for the way, we can trust that our path is laid out right in front of us… all we need is our willingness to take the journey. As a meditative tool, a labyrinth invariably takes us to ‘the point’ and mirrors our own journey through life, allowing us to examine and direct our intentions from a different perspective. It provides a calm, universal focus which is not tied to any particular spiritual approach and can therefore be applied as required. An empty canvas for our personal bigger picture. The beauty of impermanence. “In Utero”, Compton Beach, 2014. The process of creating a labyrinth is profound in itself and can be experienced in participatory events. 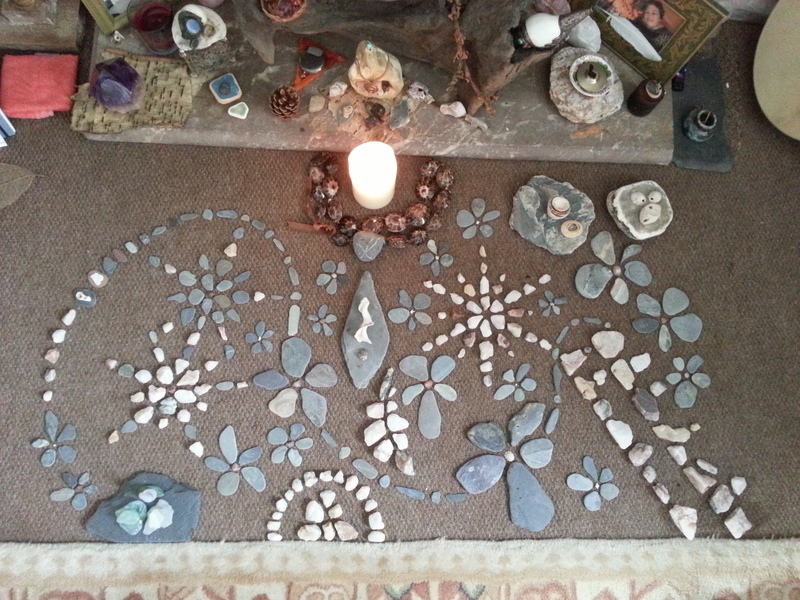 As a labyrinth maker, I use materials found on site or recycled/natural materials wherever possible. Labyrinths created in the tidal zone on the beach hold a wonderful rhythm of ebb and flow and lend themselves to ceremony for all kinds of life transitions. Labyrinth walker standing on the threshold. 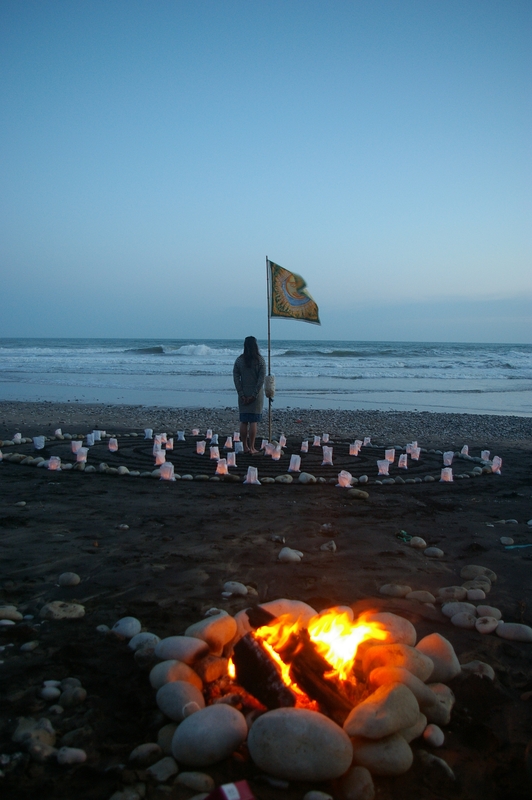 Summer Solstice 2011. 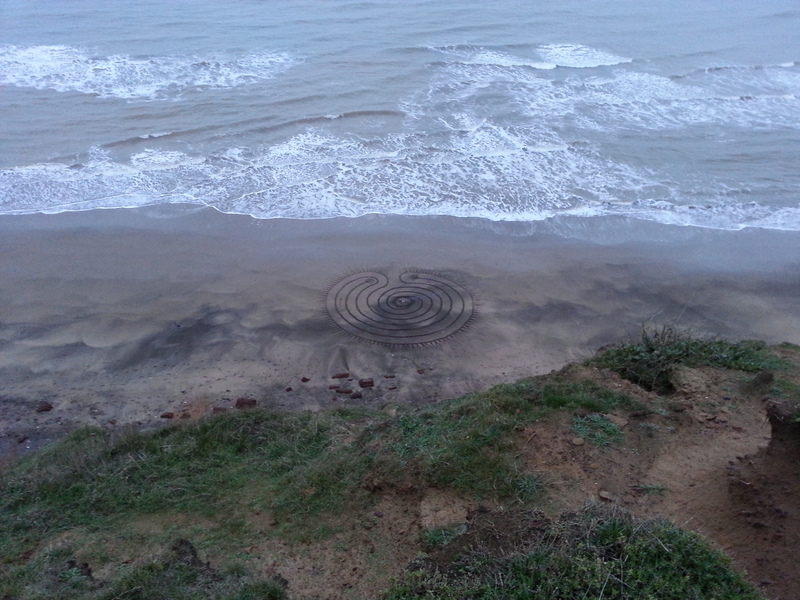 Each labyrinth has its own beauty and purpose and energises both the space it inhabits and the people who walk it. I’m still not sure what exactly happened there. I think I’ll just relate to you the course of events and let you form your own view. There’s this beach close to where I live that has attracted me, although it isn’t anything special as far as beaches go, really. It does have a pleasant outlook on lands not too far offshore. My main attraction from the first time I went there, however, have been the pebbles and rocks you can find. There are all manner of white, pink, yellow and green quartz rocks, slate-like, flat stones, and what looks like tumbled crystals of garnet and other semi-precious gems. Wow. 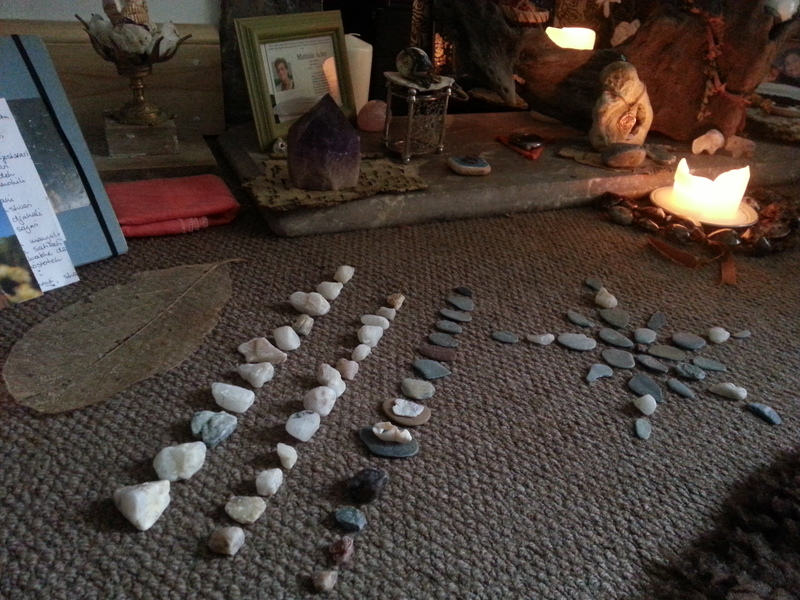 On 25 April 2015 around 7am during my morning meditation practice, some pebbles I had picked up the previous day – pure and white, grey and flat – started to make themselves known, and I began to arrange them on the floor in front of me without thinking. “Ah,” I thought,”visitors.” It seemed like they wanted to join me in meditation, and I welcomed and contemplated and sat with them. They somehow remained in my head all day, so the next morning I went back to the beach and picked up a whole bagful. Pure and white, grey and flat. I just had to, although it was a very blustery day. And sure enough, during the following morning’s meditation, more of them asked to participate. Very puzzling. Even more showed up the day after. There was a way in which they wanted to be placed that seemed quite clear. Like a mandala. My heart was feeling heavy as I had become aware of events in Nepal, and my prayers were rippling out into the ether for the people affected by the earthquake. “Please ask your kind to go easy on my kind”, I whispered to the stones. 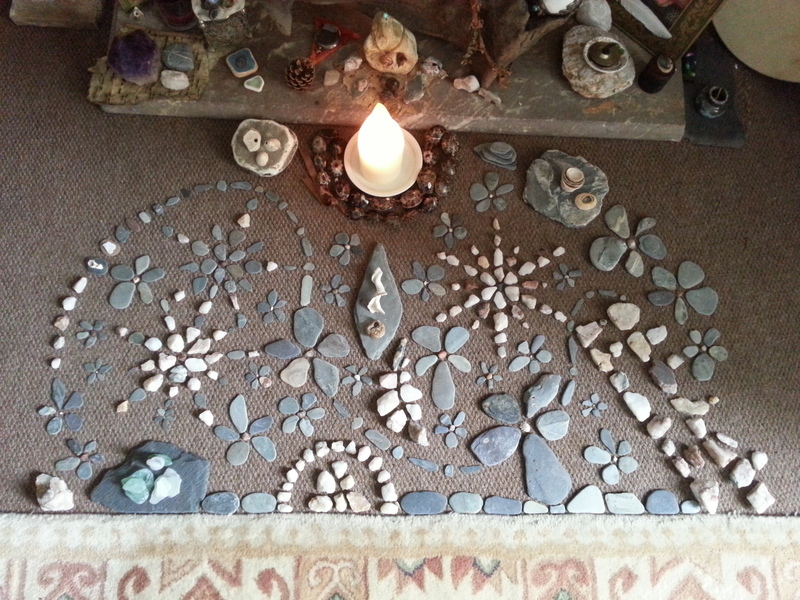 When I emerged from my meditation, all stones had claimed their place. Stone language! After contemplating what I could see, I went online and researched the exact timing of the first earthquake. The 2015 Nepal earthquake, also called the Gorkha earthquake and Nepal Greater Earthquake (महाभुकम्प mahābʱʉkəmp (mahabhookamp) in Nepali) occurred at 11:56 NST on 25 April. That’s 7.11am British Summer Time. Yes, on 25 April. I’m amazed and bow to the forces of nature, which are far greater than I could ever understand. Please send your thoughts and prayers to the people. The little girl was watching her own feet move swiftly through the summer grass. “Run!” they had urged her. Run. There had no longer been any options. Obeying their command, she crossed the meadow and made for the stream, and the woods beyond. Anywhere, anywhere, to get away from what now lay behind her, what had caused her breath to freeze inside her lungs before it could turn into a scream. She silently crossed the stone bridge and began to climb the narrow path at the foot of the mountain, her heart darting ahead in front of her like a startled deer. Up and up. The forest rose tall on either side, in front of her, and then also behind her. “Keep running,” her feet insisted, but her body was beginning to tire and would no longer obey them. She left the path through a gap in the undergrowth and collapsed in a small dell, thick layers of pine needles tenderly cushioning her fall. This was the end. This was as far as she could run. An abyss of despair grew wide and dark inside her chest, devouring her whole world. Nothing else existed, only it. Only it. Her breath began to return in sobs, small at first but then shaking her violently, making her gasp, forcing her to howl out this acrid void. After a while, a soft wind began to whisper in the trees, bringing with it the warm scent of summer and of earth. The girl wiped her eyes. Above her, treetops were swaying gently in the breeze, moving this way and that, making visible the breath of the world. “It’s alright,” the forest whispered. “You are safe with me.” A wave of warmth washed over her, and she felt herself cradled and protected by her surroundings. Her heart grew calm, and her strength began to return. Soon she would get up and walk back to the house, that place where her parents were so immersed in fighting with each other that they hadn’t even noticed her leave, this time for good.